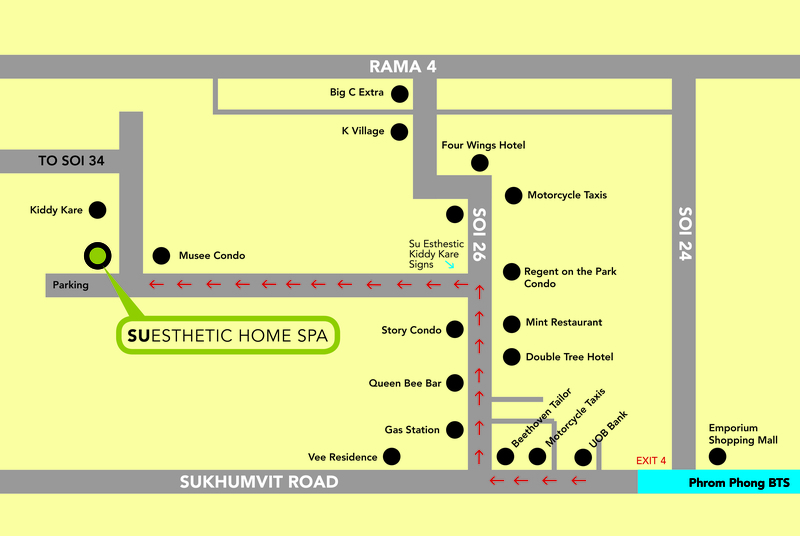 Su Esthetic Korean Home Spa is located in the heart of the Sukhumvit area near the Emporium Shopping Mall on a lane off Sukhumvit Soi 26. We are a bit tricky to find and suggest that visitors who are not familiar with Bangkok check our location on Google Maps (see below) before heading out or have the taxi driver call us on 022-585-224 or 082 3344 086 and we can provide directions. Address Soi Thanphuying Phuangrat Praphai, Sukhumvit Soi 26, Bangkok 10110. By BTS or Taxi The spa is a 10 to 15 minute walk or 5 minute taxi ride from the Phrom Phong BTS Station (Sukhumvit Line). Click the YouTube video link below for walking directions from Phrom Phong Station. To take a taxi, take Exit 4 from the BTS and u-turn at street level. Walk east one block (away from the Emporium Shopping Mall) passed UOB Bank to Soi 26. Flag a taxi on Soi 26. Sorry, credit cards are not accepted.